"United Church Seminary student body, 1905-1906, St. Paul, Minnesota"
This photo shows seminary students in a classroom at the United Church Seminary in the St. Anthony Park neighborhood of St. Paul in 1905 or 1906. Note the formal dress and the gas lamps. Seminary students and clergy at that time were exclusively male. 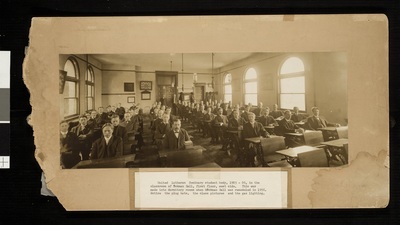 Front of photograph reads: United Lutheran Seminary student body, 1905-06, in the classroom of Bockman Hall, first floor, west side. This was made into dormitory rooms when Bockman Hall was remodeled in 1956. Notice the plug hats, the class pictures and the gas lighting.